Samsung is upping its microSD card game. Today the company announced its new 128GB PRO Plus memory cards. Compared to the existing 128GB EVO Plus cards, these offer significantly faster write speeds. The EVO Plus maxed out at 80MB/s and 20MB/s read/write. The new 128GB PRO Plus cards can reach speeds of 95 MB/s and 90MB/s. The latter number is over four times faster. This makes a noticeable difference when you're taking photos rapidly or saving content directly to the card. Samsung advertises these cards as waterproof (IEC 60529, IPX7), temperature proof, X-ray proof, and magnetic proof. They're also flagship proof. Without microSD slots, the latest generation of Samsung's top-of-the-line phones are not capable of enjoying these cards. Fortunately you don't need a Samsung phone to take advantage of these cards, or even a smartphone for that matter. Use the compatible adapter to stick one in your camcorder. With this much space, you will be recording for days. Thing is, the new card has a starting price of $199.99. At that price, you could possibly snag two 200GB SanDisk microSD cards if you play your cards right. Those aren't quite as fast, but there's a decent chance you wouldn't notice anyway. 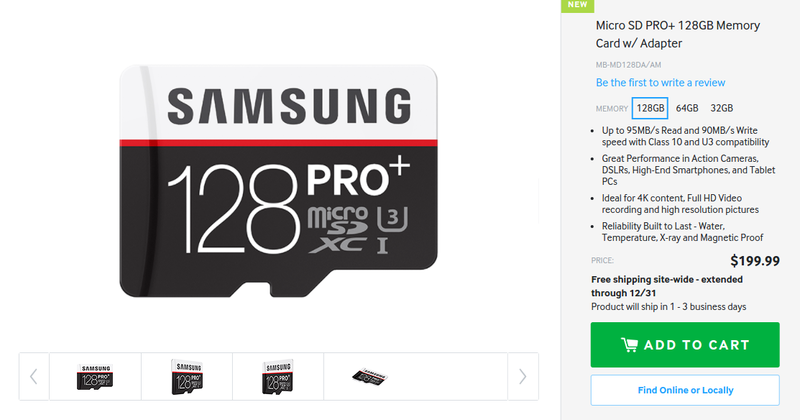 Fortunately microSD cards typically take too long to drop in price. If you have your eyes set on a 128GB PRO Plus card but don't want to hand over enough money to pay for a new phone, just give it time.